Space heaters are a great appliance to heat up individual rooms whether it is a bathroom, bedroom, office, or living room. They can be especially useful in large, old, or drafty houses and can sometimes help lower your heating bill if you use them effectively. The best space heaters are capable of heating up an average sized room within less than 15 minutes. The top plug-in models will use about 1500 watts of power, while smaller models may only use 600-900 watts. You absolutely want to get a model with a fan to force the heat out quicker. Oscillating action is also a nice feature as it spreads warmth around the room. Safety features are also extremely important. You want a heater that has a sensor that will shut itself off if it overheats or if tipped over. Also make sure that if you plan on using your space heater where there is moisture that you get a unit that is safe for bathrooms. While there are models that cost lots of money, the good news is that there are plenty of excellent units that do not cost a lot of money. For this review we only focused on electric models that cost less than $100. 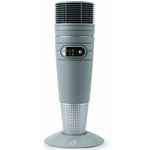 Below we review the top 5 best space heaters. We also include a spec chart comparison at the bottom of this article to compare space heaters. 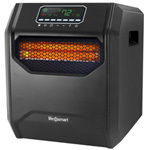 We selected the $80 Lifesmart ZCHT1001US Infrared Heater as the best space heater. This Lifesmart heater uses six infrared elements that are capable of heating a space of up to about 1000 square feet. There are two heat settings, plus an energy saving Eco mode that maintains 68° using as little energy as possible. Other features of the ZCHT1001US include an easy to read digital thermostat, 12 hour timer, remote control, and lifetime washable air filter. The heater itself is enclosed by a stylish modern black fireproof cabinet that is cool to the touch and has safety features which include a child lock out, tip over and over heat shutoffs. Overall we highly recommend Lifesmart ZCHT1001US for any sized space, but especially for larger areas. 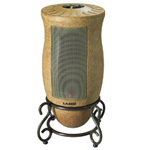 Priced around $59 the Lasko 6462 Full Circle Ceramic Heater is a great choice for a large room. It features simple digital programmable controls, a remote control, and 1500 watts of power with high, low, and thermostat controlled settings. The Lasko 6462’s 25-inch tall fan also sweeps to a full 360 degrees which means it blows heat around the entire space. This space heater works quite well to heat up a space of around 300 square feet. The Lasko 6405 provides designer series looks with a powerful ceramic oscillating heater which is why it is one of the highest rated space heaters on Amazon. Selling for about $45 it has 1500 watts of power. The Lasko 6405 has low and high comfort settings plus an adjustable thermostat with a 7 hour timer with auto shut-off. Overall it heats up medium to large sized rooms up to 300 square feet quickly and we highly recommend it. 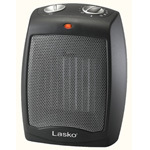 The Lasko CD09250 is an Amazon exclusive that is just a black-colored version of one of the best selling space heaters of all time – the Lasko 754200. This $32 heater has a high setting of 1500 watts and a 900 watt low setting. Measuring 9.2″ x 7″ x 5.75″ it is quite small and doesn’t take up much space. On the downside it is a little bit noisy and it will not heat up a very large room. However, if you just need a cheap space heater to heat up a small space then this thing will work great. The cheapest space heater on our list is the Honeywell HCE200W UberHeat Ceramic Heater which sells for under $30. 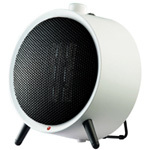 This compact ceramic heater is ideal for small rooms or offices for personal heating. It features an adjustable thermostat, two heat settings, cool touch housing, auto-off tip-over switch, and overheat protection. The main weakness of the HCE200W is that it will not heat up a large room very well, instead it works best for a space of up to 150 square feet. So if you just want to heat a room of less than 15′ x 10′ then the Honeywell HCE200W UberHeat Ceramic Heater is a great choice thanks to its cheap price.